Rochester is not Lancaster, but it does have something in common with the famous Pennsylvania county. The upstate NY city lies close to numerous Amish communities, and also has a fair share of Amish furniture businesses located in the city itself or in neighboring towns. Residents of Rochester and nearby suburbs and towns including Webster, Irondequoit, Brighton, Penfield, Henrietta, North Chili, Spencerport, Hilton, Riga, and Brockport can find Amish furniture outlets in the vicinity. Additionally, numerous Amish communities lie within a short drive of the Rochester area, offering possibilities for direct purchase. Use the guide below to find retail Amish furniture stores in the Rochester area, as well as locations of Amish settlements near Rochester. You can also visit the New York Amish furniture main page for other Amish furniture locations around the Empire State. Amish-owned businesses as a rule are closed on Sundays, though non-Amish owned furniture retailers may be open. Call to verify information before traveling long distances. Find furniture in other states with the Amish Furniture 50-state directory. Local dealer which carries Amish furniture primarily made by craftsmen in Holmes and Wayne Counties in Ohio; does custom finishing. Also sells non-Amish furniture. Amish desks, bedroom furniture including dressers & nightstands, computer desks, beds, tables, kitchen islands, more. Amish furniture retailer lying in Rochester proper selling custom-crafted furniture for the entire home. Lying on the west end of the greater Rochester area. This Amish furniture dealer carries a broad selection including beds, occasional tables, rockers, outdoor pieces, buffets, hutches, dining chairs & tables, entertainment centers, benches, stools, more. Located on the west side of greater Rochester, just off Highway 490. Amish bedroom, living room, dining room furniture including beds, dining tables, chairs. Crafted in multiple styles including the ever-popular Shaker and Mission. Furniture business lying about 45 minutes south of the Rochester area. Sells Amish outdoor furniture, sheds, lawn decor, barns, home furniture. Two Empire State locations–Springwater and Big Flats. Business selling Amish woodcraft lying southwest of the city. Bedroom, dining room, children’s, office, living room, outdoor furniture. Also sells Amish-made pine furniture. Like the Empire State as a whole, western New York has been a hotspot for Amish migration, with around a dozen Amish communities within an hour’s drive of Rochester, many of them founded in the past few years. Below are a few of the larger Amish settlements within the vicinity of Rochester. Since woodworking is such a popular occupation for the Amish, there is a good chance that these communities are home to numerous Amish furniture businesses. 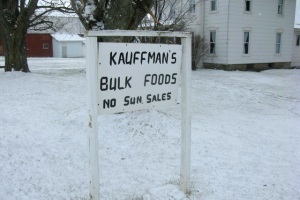 While many Amish prefer to sell their goods wholesale only, some do provide retail buying. If you’re looking for Amish furniture direct from the source, and have a little bit of time at your disposal, you might consider leaving the Rochester area for a day and visiting one of these communities. 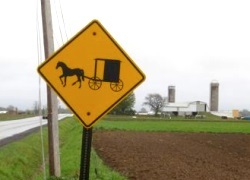 Amish businesses can often be found by following signs commonly situated by the roadside or by inquiring locally. Romulus/Ovid (Seneca County): Lying about an hour’s drive from the Rochester area, the community of Romulus and Ovid is situated between two of the Finger Lakes (Seneca Lake and Cayuga Lake). This community of 4 church districts numbers around 500 Amish residents. Steuben County communities: Around an hour south of Rochester lies Steuben County, which as of 2013 was home to 4 Amish communities. The oldest lies at Prattsburgh, though the largest in the county is the Woodhull/Jasper area community. The Woodhull/Jasper area is home to a traditional Amish group infamously visited by a road tragedy in which parents of 12 were among those killed when a drunken driver struck a van carrying a group of Amish people. The community is a sizeable one, and at fourth-largest in the state, is home to around 200 Amish households (businesses in the community include this Amish-owned bulk foods store). Other Steuben County communities include those in the area of Addison, and Pulteney/Hammondsport. Clyde (Seneca and Wayne Counties): One of the closest communities to Rochester is found in the area of Clyde, lying about 45 minutes east of Webster. Founded in the late 1990s, this settlement had grown to 3 congregations (80-100 households) by 2013. Conewango Valley (Cattaraugus County): More distant from the others listed here, the Conewango Valley community makes the list as it is the oldest and largest Amish community in the state, having been founded in 1949. Around 2,000 Amish reside in the Conewango Valley community, which is home to numerous Amish businesses including furniture makers. About 2 hours from the Rochester area. I would like to find an Amish Settlement near Ontario Ny. I would like to purchase a rocking chair from an Amish furniture maker directly. Ontario I see is in Wayne County. Wayne has 4 Amish settlements, none of them huge, but the Clyde area community in Wayne and Seneca Counties is 3 church districts in size. That’s probably going to be anywhere from 60-100 families, and there should be at least a couple furniture makers in a community that size. Where can we buy furniture direct from an amish furniture maker either in Pennsylvania or upstate NY? I would like to buy kitchen cabinets directly from an Amish cabinet maker. Can you tell me where I night find some near Rochester NY? My husband and I live in Pittsford, NY, near Rochester and are interested in the construction of a wooden garden fence, approx. 24’X54′, I am wondering if anyone in your community builds fences? It will be facing the street so we would like it to be ecpecially beautiful!